Sign-up for the 4th and final cooking series class of the semester, Tuesday, April 30 at 6pm. We will be working on desserts to finish up our series. Don’t miss out on this great event series! Development outside of the classroom is important to a Blue Jay’s experience at Johns Hopkins. We bring many opportunities to development through events and activities geared toward learning new skills and cultivating cultural experiences. Spots for our cooking class is limited because of the size of the kitchen, if you are interested in signing up for next upcoming class, please fill out the reservation form and the Dining office will contact you with more details if there are openings or if you are place on the waitlist. If you are on the wait-list, we ask that you come to the event at 6:05-6:15pm to see if there are no shows and room in the class. Walk-ins are welcome if we have room in the class, which isn’t always guaranteed. 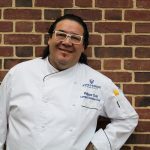 Get to know our Executive Chef! 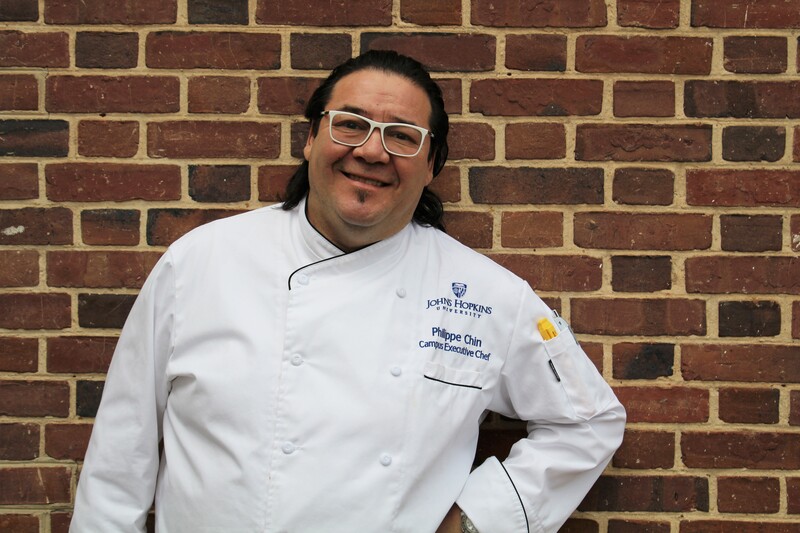 Chef Phillippe oversees all culinary expertise for the entire Hopkins Dining Program. His favorite food to cook is Fish because it is versatile. One ingredient he could not live without in the kitchen is salt. His parents taught him how to cook. Three words used to describe his cooking style are playful, robust & texture. Sterling Brunch is a long standing Hopkins Tradition for our students, faculty, staff, alumni and anyone in the community. Our menu changes with the season and include gourmet items and dessert. Join us at Fresh Foods Café to enjoy a delicious brunch and live musical entertainment provided by various performance groups from our campus. For specific menu highlights check out our Facebook page for each brunch’s event info (menu highlights will normally be posted a week or so before). The Eat Local Challenge is an annual event that happens each fall in late September where our chefs are taking on the challenge to have a meal made entirely of foods grown within 150 miles of the Fresh Food Café. We also like to highlight our own campus commitment of sourcing 35% “real food” by 2020, real food is defined as being local/community based, ecologically sound, fair and/or humane food our Real Food Challenge. This year’s day was Tuesday, September 25. Fresh Food Cafe’s challenge will be from 11am-2pm and Nolan’s challenge will be form 5-7pm.